It's Pep Rally week and we are here today to share a sampling of the NEW Paper Smooches May/June release with you! FOUR new stamps and EIGHT new dies will be available to purchase at midnight on April 30th (eastern time) (12:01 am on May 1) You will find our new releases HERE! My friend is a prolific instagrammer, so I thought I'd use my Polaroid dies and Pip Squeak stamps. In my camera and word die cuts, I used some metallic silver paper. They totally look like they are made of brushed stainless steel (which I kinda love:). The Congratulations word die creates a really intricate die cut. For detailed cuts like this, I highly recommend the Xyron sticker maker. So much easier and cleaner than using a glue pen (which was the way I used to do it). Here's a closer look at those awesome die cuts! Since Paper Smooches is working along side of Xyron adhesives this week, they have a special prize to offer one random winner as well. The prize is worth $100. To see a photo of the prize, please visit the PS blog. You can visit the Xyron blog to see what their fabulous team has created with our PS products. While you are there, you will have a chance to win a $20 gift code to win some PS products! Thanks so much for stopping in! Hope you have a fantastic day! Oh my gosh!! This card is really stinkin' cute!! Love the metallic paper. GORGEOUS! I think I have been pretty clear on how much I love gold. And after seeing this camera I pretty much got confirmation! You guys crack me up! This time I actually used silver paper (I know I even shocked myself):) I haven't given up the gold yet, but I thought silver may be better for cameras. Come to think of it though, a GOLD camera would be awesome!!! That baby is so funny. I love this card! So cute, I love the gold and turquoise together, it really pops. Love the card! So cute for the birth of a baby! Very clever card. You definitely need a Xyron to glue that die cut! What an adorable card...love the gold accents! Such a creative and lovely design, the gold is so pretty!! JJ, this is super cute! Totally fun! JJ you are sooooooooo fabulous! LOVE LOVE LOVE this card! LOVE the camera with the polaroid of the baby and the gold sentiment! FAB x100000000! This is laugh out loud! cute!! Thank you fro the chance to win. Adorable idea -- love the waving baby! Super fabulous! Love this card! Your card is so cute. Love the congrats die. Adorable and it makes you smile! This card made me smile! So cute!! very fun card, its really cute, the gold is very striking!!! What a clever and adorable design! LOL...your baby is so cute and so is the card! Shared the blog hop on FB. This is a card for Erin!!!! I love the gold on the camera, this really is cracking me up! Wow love all that Gold and the wonderful congrats die. That baby is too cute! I really like the idea of using the Xyron to adhere the tiny pieces. Oh my WORD, this is sooooo FUN and CUUUUUTE!!! And creative! I just can't stand it!! way to use the camera. This is a perfect baby congrats card! Darling! Love that metallic paper and the congratulations die! Super cute! I Facebooked and posted on my blog. I just posted about the hop on my blog! AND it is on my sidebar, too. Cute way to use that Instagram die! Super cute card! The gold sentiment is beautiful! Thank you for the inspiration. 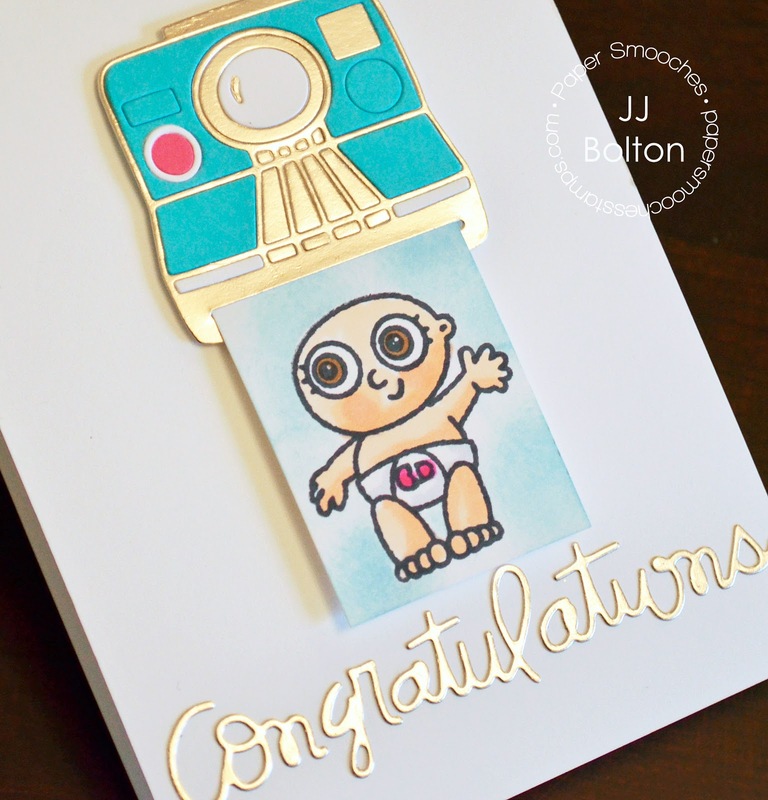 LOVE your metallic die cut sentiment & camera, LOVE the camera inlays and LOVE your SUPER CUTE little baby photo coming out of the camera too!!! What a great retro camera. Just love it and I'm sure your friend will too. Awesome card I love the picture coming out of the camera. Couldn't help but smile when I saw this one, very cute. Great card! Your friend will love it. EEEKKK! This is so darling! So inventive---I love the gold camera! Soooo Cute!! And just as bold as my son was ha ha! What a CUTIE! Love the way you made it look like the photo coming right out of the camera! Fun card! Love the idea of the Polaroid. I hated to see them become extinct. Great card. Omgosh! This is beyond adorable. Love it!!! Your card is cute! thanks! Love the metallic accents on the camera! I'd <3 to win, I lost my entire craft room and everything in it due to a fire! LOL ...Your card is so awesome!! I love the camera and the Baby is Hilarious!! TFS!! Such a funny and cute idea! for a baby congratulations, JJ! Haha!! The baby is so stink in' cute. Clever! Loving that camera, especially with the gold paper. Awesome card! So diggin'' your baby! I just love this. 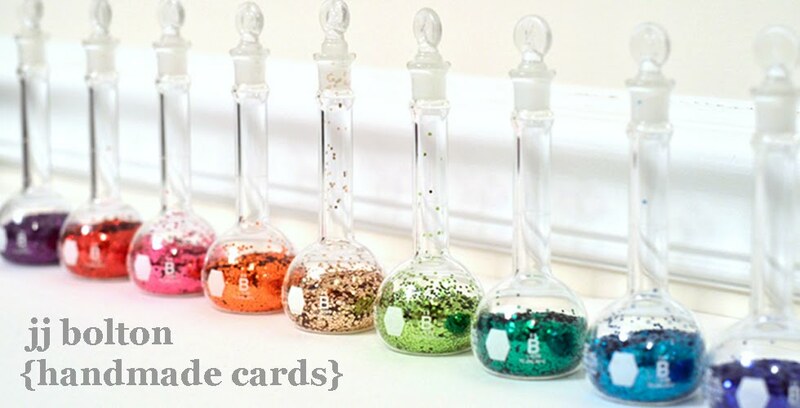 I have several baby cards to do in the upcoming weeks and months. Thanks for the inspiration. Awww this is totally adorbs JJ!!! I love the gold camera and matching gold Congratulations! This card is obviously fit for a pint sized superstar!!! :D Thanks so much for sharing your darling creation and inspiring us so!!! Fabulous stuff!!! that is one of my fav cards! I love it! What a cute card! I love the baby and colors, thanks for sharing. WOW!! The use of the silver paper in your diecuts is so striking -- LOVE IT!! Love how you used metallics with the colors and the cute baby "photo". To darn cute! Thanks for sharing! What a cute baby card! I love how you used gold on the camera! Love your choice of colors and the creative way you used the products. I shared the hop on Facebook!